Well, first things first. Tankiversary. Last week marked the first time the Tank was used in combat. So, to commemorate that, here is my favourite tank, the Jagdpanther! Armed with the long 88mm gun, with heavy, sloping armour and looking as nasty as a tank can be, the Jagdpanther is easily my favourite! 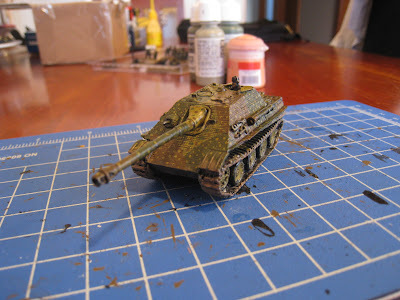 I brought my 5 tanks out last week to give them an update, the one above has Step 1 completed; the blacklining done. I will add some decals, and perhaps more weathering. 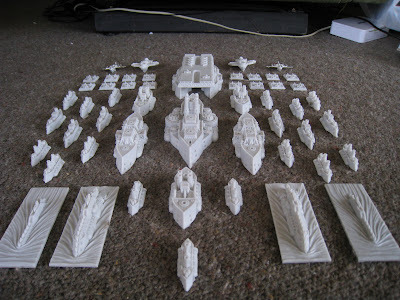 Dystopian Wars is something that has always, always tempted me. It is a Victorian Steam Punk style game, based around naval fleets clashing over vast oceans, with support from Air units too. I like it because the game mechanics are pretty simple, but more than that, the models are simply fantastic! They have been designed using 3D rendering programs on a computer, then cut the molds from them. This means that the detail on the models is quite simply absurd- these ships have stairs! Simply put, they are jokishly pretty and are a dream to paint. So, when I saw them on the shelf in a gaming store on my recent trip over the ditch, there was only going to be one result. I invested, relativly heavily! 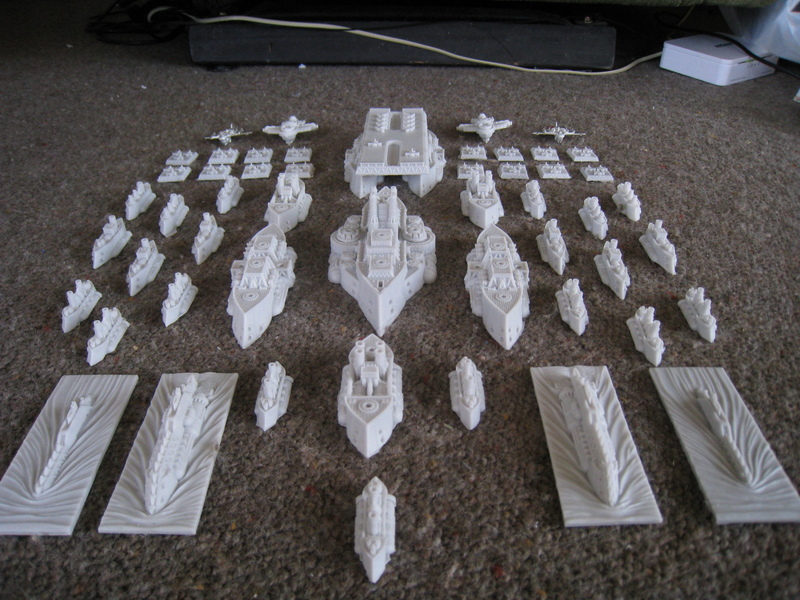 So, this is my entire Kingdom of Brittania fleet! I will do a total list of what is there tonight, but for right now, here are my first few painted vessels. These are Bastion Class Escorts. They have no main guns, but are equipped with Anti-Aircraft and also Anti-Torpedo capability to add to the capital ship that they are defending. 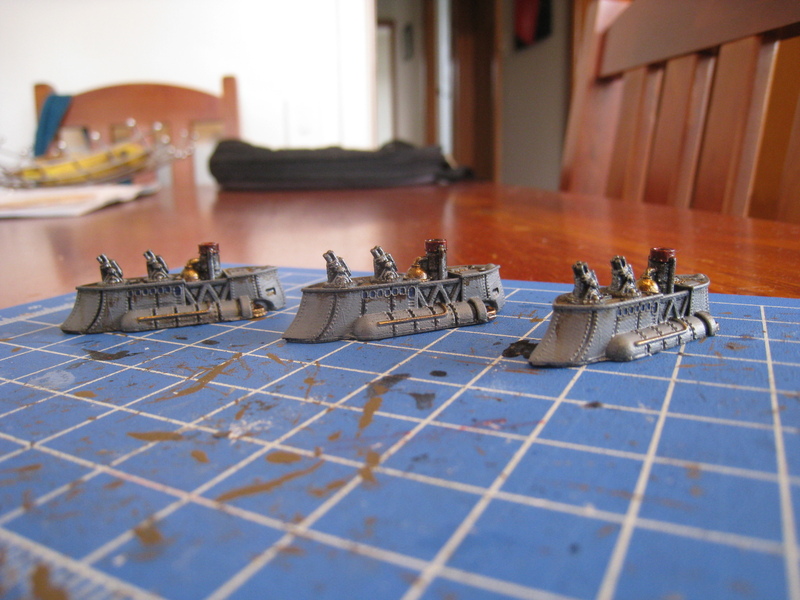 I like the rusted-grey look I have gotten there, should look really good as a whole fleet! I've got a steampunk rpg campaign I'm working on. I'll get you an invite if you're interested. Also need to chat re Conquest lists and mini's. Definetly massive flyers and submarines! Sounds good about the RPG- just give me a bell about it. That small scale stuff is pretty cool, Pooch. I much prefer gaming to either be small scale or 28mm - pity we never did FOW as 6mm lol. Wasn't Steve S a little keen on this too? Damnitt, now you've got me looking up the armies! Boy. I really do get a bit of a tough wrap around here! OK, those look really cool. I've just placed an order for a Prussian battlegroup, to be painted up in Austro-Hungarian colours. Oh for Goodness sake Than, can't you even get your pretend-history in the correct pretend colour-scheme? :P I thought you'd be keen on this one. While I'm in two minds about Napoleonics THESE are cool and I have enough 28mm plastics to keep the pro-painting service utilised until WGF sorts out my Sengoku period stuff. But which fleet? Prussians and Brits LOOK coolest but I am still unsure. It doesn't help that Russians hover tantalizingly just beyond the horizon.